Check out this beautiful used 85' Pacific Mariner Yacht for sale! : Atlantic Yacht & Ship, Inc. Speaking with Ed Biggie reports a deal on a beautiful used 85′ Pacific Mariner yacht for sale in Florida. In the first place, this is hull No. 16 of the 85′ Pacific Mariner series. In fact, this pilot house yacht was introduced at the Fort Lauderdale Boat Show in 2009. Then the used 85′ Pacific Mariner yacht series was designed for three things. These are optimum quality, comfort, style and value in a proven platform. Overall, the spacious, well-appointed four stateroom arrangement is key. Similarly, the industry leading quiet acoustics ensure a relaxing time aboard. Exceptional details in wood, stone, and elegant fabrics only add to the thoughtful layout. Rounded contours make for profile and exterior styling elements that define this used 85′ Pacific Mariner. Also larger port lights illuminate the master stateroom. Additionally, topside, the fly bridge deck overhangs allow an expanded and spacious boat deck. The interior arrangement has three guest suites forward on the lower deck plus a full-beam master. A nice touch is how the master has a separate entrance. The taller deck house profile has allowed an increase in headroom at the pilot house, and the addition of an overhead cabinet above the peninsula counter in the adjacent galley. The main-deck saloon features separate sitting, bar, and dining areas. Quarters aft of the engine room accommodate a crew of one or two, or in the case of an owner-operated boat, additional guests. 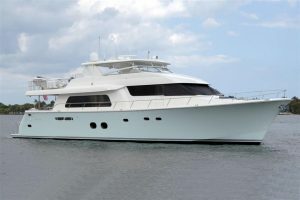 For more information on this used 85′ Pacific Mariner yacht for sale in Florida be sure to contact Ed Biggie today!